This unique dairy cow hoof care system was named "One of the Best New Products in 2011" by Dairy Herd Management magazine. Dairy Solutions, based in Roswell, New Mexico, is a leading maker of systems for promoting health in dairy herds. 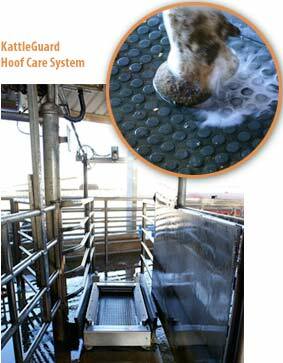 Their hoof care system, KattleGuard, that was a given a "Top 10 innovative products 2011" award by the influential Dairy Herd Management magazine. The KattleGuard system uses a proprietary sensor pad that can detect the position of a cow's hoof falls, plus an array of solenoid controlled nozzles that target a low flow, high velocity sanitising spray directly at the hooves. The result is a system that uses less fluid and at the same time eliminates the cross-contamination that can occur in conventional immersion baths. The control system for KattleGuard uses two SPLat off the shelf controllers, an MS120 and a CC18, plus two MBIO16 expansion boards to drive the solenoid array. The CC18 reads the sensor array and performs time-critical pre-processing, as well as counting cows, and detecting problems like a cow stalling on the sensor pad. The MS120 performs an elaborate mapping between sensor patterns and the resultant spray patterns, plus accurate timing of the sprays. It also manages freeze-up prevention, as well as providing a user interface for setting operating parameter and reading out performance statistics. The MBIO16s provide 2A solid state drives for 11 solenoid valves and auxilliary equipment like the chemical dosing pump. The programming was done by SPLat Controls, who worked very closely with Dairy Solutions through several iterations of the product development. According to John Greeson, President of Dairy Solutions, "SPLat has made it easy to incorporate logic and controls into our products, moving from concept to reality. Would highly recommend them to anyone needing PLC controls."